Burger King has been on a tear in bringing out new flavors for their signature Chicken Fries. 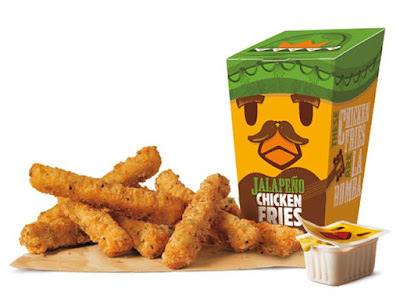 The latest is new, limited-time Jalapeno Chicken Fries. The new menu item features ground white meat chicken shaped roughly into the shape of fries and come breaded with a jalapeno seasoning. Jalapeno Chicken Fries come in an order of nine pieces for a suggested price of $2.89 (may vary) at participating Burger King restaurants. Burger King has only gone with spicy flavors as far as new flavors for Chicken Fries go. Last year, they introduced new Fiery and Buffalo flavors for a limited time.